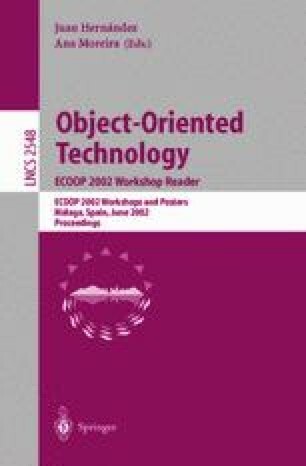 This report summarises the presentations and discussions of the First Workshop on Model-based Software Reuse, held in conjunction with the 16th European Conference on Object-Oriented Programming (ECOOP) Malaga, Spain June 10, 2002. This workshop was motivated by the observation that convenient models are very useful to understand the mechanisms of reuse. Models may help to define the interoperability between components, to detect feature interaction and to increase the traceability. They have the potential to define the essential aspects of the compositionality of the assets (i.e., components, aspects, views, etc.). Common problems discussed were how to reason about the properties of composed assets (with the focus on invalid asset compositions detection) and how to model assets to enable such reasoning. Eleven papers have been accepted and presented. Discussion groups in the areas “Software Architectures as Composed Components”, “Automated Analysis and Verification” and “Modelling and Formalising” were formed. M. Clauß, K. Czarnecki, B. Franczyk, and A. Speck. GCSE’01 Feature Modeling Workshop, Part of the Third International Symposium on Generative and Component-Based Software Engineering (GCSE 2001). Erfurt, Germany, September 2001. http://www-st.inf.tu-dresden.de/gcse-fm01/. E. Pulvermüller, I. Borne, N. Bouraqadi, P. Cointe, and U. Assmann. Workshop on Software Composition (SC 2002), affiliated with ETAPS 2002. Grenoble, France, April 2002. http://www.easycomp.org/sc2002/. E. Pulvermüller, A. Speck, M. D’Hondt, W.D. De Meuter, and J.O. Coplien. Workshop on Feature Interaction in Composed Systems, ECOOP 2001. Budapest, Hungary, June 2001. http://i44w3.info.unikarlsruhe. de/~pulvermu/workshops/ecoop2001/.